BETHESDA, Md., USA – Oct. 13, 2017 – Alley Cat Allies will celebrate the international premiere of Global Cat Day on Oct. 16, 2017, as a day for people around the world to stand up for policies that protect all cats in their communities. Participants are signing a pledge on GlobalCatDay.org to support advocacy efforts for all cats, including the cats who call the outdoors their home. 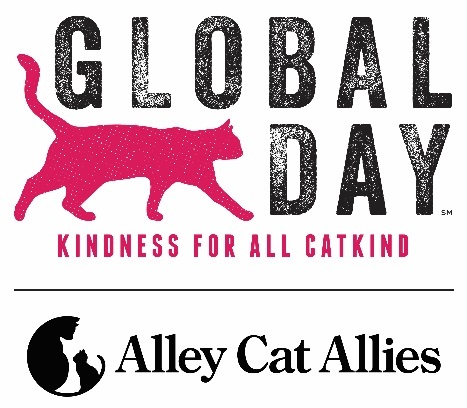 With the campaign already racing toward a goal of 100,000 people taking the pledge by year’s end, Alley Cat Allies president and founder Becky Robinson explained that the lasting impact of Global Cat Day will be a powerful message about protecting cats who live outside. Global Cat Day has evolved from National Feral Cat Day®, which Alley Cat Allies created on its 10th anniversary in 2001 to raise awareness about community cats, promote Trap-Neuter-Return (TNR), and recognize the millions of compassionate Americans who care for them. Because compassion knows no borders, international participation in National Feral Cat Day grew each year, reaching at least 20 countries with last year’s edition. That mark has already been eclipsed this year, with engagement for the inaugural Global Cat Day coming from more than 40 countries, from Australia to the United Kingdom, Belgium to Brazil, Saudi Arabia to South Africa and many more. “It’s very exciting that interest in advocating for outdoor cats is coming from so many corners of the globe, because it’s more evidence that this is now truly an international movement,” Robinson added.